A Very Civil War Between Kevin Feige And Isaac Perlmutter? 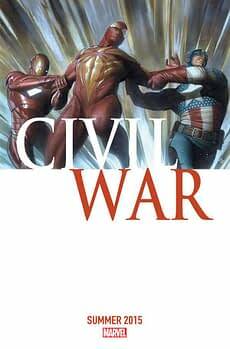 Home » Comics » A Very Civil War Between Kevin Feige And Isaac Perlmutter? Last night’s Variety promised that the next Captain America movie would be based on Mark Millar and Steve McNiven‘s Civil War series, and would co-star Robert Downey Jr as Tony Stark and Iron Man. It coincides with Marvel’s plans not only to do a new Secret Wars event next year but also a Civil War revival in the summer. My own expectations are that this would also lead to the death of Chris Evans‘ Captain America with Falcon talking the role in Captain America 4…. We have recently reported on stories regarding Ike Perlmutter cancelling the Fantastic Four comic out of spite, as part of soured relations between Fox Studios and Marvel over the rights to X-Men and Fantastic Four comics and merchandise. Some have queried whether such moves would make any credible sense. I was also told at New York Comic Con about how, at Marvel Studios, and on set, Marvel’s Kevin Feige rules the roost… until Ike Perlmutter is on the phone or arrives in person, and Feige becomes utterly subservient. But according to Variety, this may be just his way of trying to get what he wants, and understanding Perlmutter’s importance. It does rather recognise the role that Isaac Perlmutter is carving out for himself in the post-Disney buyout Marvel. And if there is a war between Perlmutter and Feige, then it is a very civil war indeed.